King Kutter Professional Landscape Rake are engineered for versatility, for the professional landscaper, farmer, homeowner or contractor. They are great for gravel road grading, lot maintenance, seed bed preparation, pasture renovation, the removal of rocks, roots, or trash, plus much more. These landscape rake attachments are equipped with 5 forward and 5 reverse settings for maximum flexibility and maneuverability. The unique design features an adjustable stabilizer bar that allows the heat treated spring steel tines to be more or less rigid and a industrial tubing frame with reinforced formed upper frame for added strength. 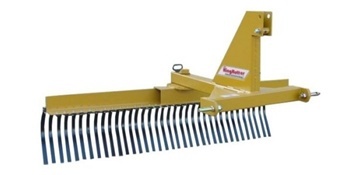 King Kutter Professional Landscape Rake. Free shipping within 1,000 miles! Rake arrived damaged. Top link was bent closed on one side. Able to put a large wrench on the bend to straighten it out. Swivel angle adjustment assembly is not aligned properly. With rake positioned in forward position everything lines up and pin will drop in the angle adjustment holes. With rake in rear-facing position angle adjustment holes do not line up and pin will not fit. May be caused by what ever bent the top link, but not something fixable without major disassembly and mechanical work. Paint is not applied well, a few bare spots. First King Kutter product I have purchased, will not purchase another. 5 stars to Everything Attachments. Product delivered quickly and able to keep track of delivery. Priced several King Kutter Rakes from other suppliers and once you calculate shipping Everything Attachments was the least expensive (with free shipping). I am looking at buying a grapple bucket and will most likely buy again from Everything Attachments.